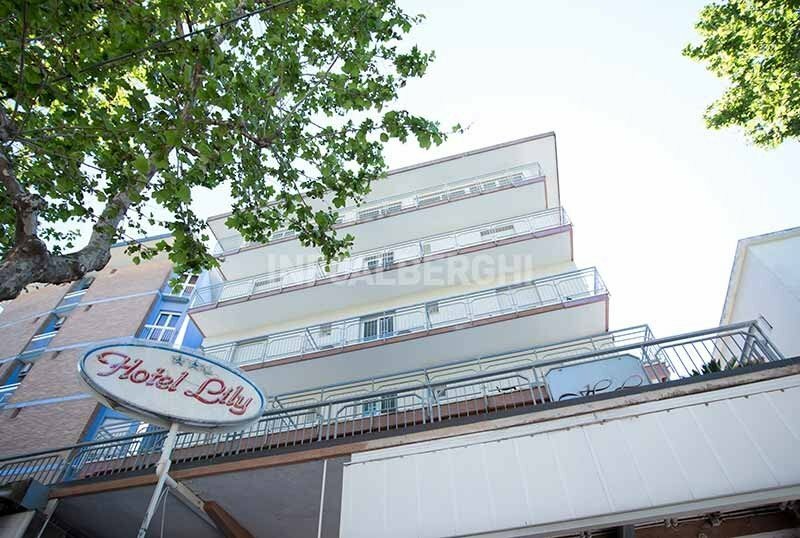 The Hotel Lily is a 3-star hotel in Rimini located near the sea and directly managed by the owners. Ideal for families, it has free WI-FI connection, air conditioning and typical local cuisine. Admits pets of all sizes at no additional cost. The hotel is located in Rimini and is a couple of minutes walk from the seafront and the beach. It overlooks Viale Regina Elena, from the bus n. 11 which connects Rimini with frequent trips to Riccione. All rooms have a balcony, air conditioning, WI-FI connection, digital terrestrial TV, safe, direct telephone and bathroom with hairdryer and shower. Some rooms offer sea views. Terrace, luggage storage, night porter and elevator. The staff organizes theme nights. PARKING : fenced and video surveillance 24h. CONVENTIONS : beach and parking. PETS : pets of all sizes are allowed on request. LUNCH AND DINNER : buffet with 3 menus of traditional local cuisine with local dishes of meat and fish. Pasta and desserts are homemade. In hotel : baby-sitting service and pediatrician on request. At meals : baby menu, high chairs at the table. The hotel has an agreement with Bagno 80, a stone's throw from the hotel, equipped with sunbeds, beach umbrella, showers and a gym. The establishment organizes numerous moments of entertainment for adults and children: games, aquagym and much more. Do not miss the beach volleyball, beach tennis and basketball courts, as well as table tennis and table football. The authorized beach for the entry of pets. free and unlimited entries to the SKARAMACAI park with swimming pool and inflatable park with shows and entertainment.